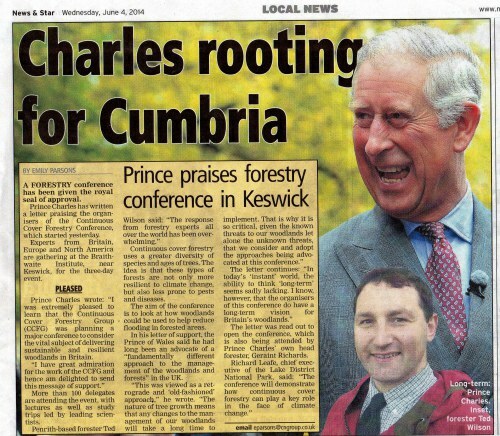 There was also a welcoming statement from Prince Charles endorsing this type of forestry and wishing this event well. His head forester was in attendance too. A guest speaker also talked about Osprey settling in the forests in this lake area and the enormous tourism that has resulted. The CCFG committee are now compiling information from all the recorded talks and we will share these when they become available. The event also received considerable press and TV coverage which indicates a growing audience for a different type of forestry in the UK. Recent storms and the increase in tree disease in the UK have brought renewed attention to the important role of forests there. Below a slideshow of photos from the fieldtrips and conference – click on an image to show full-screen slideshow. 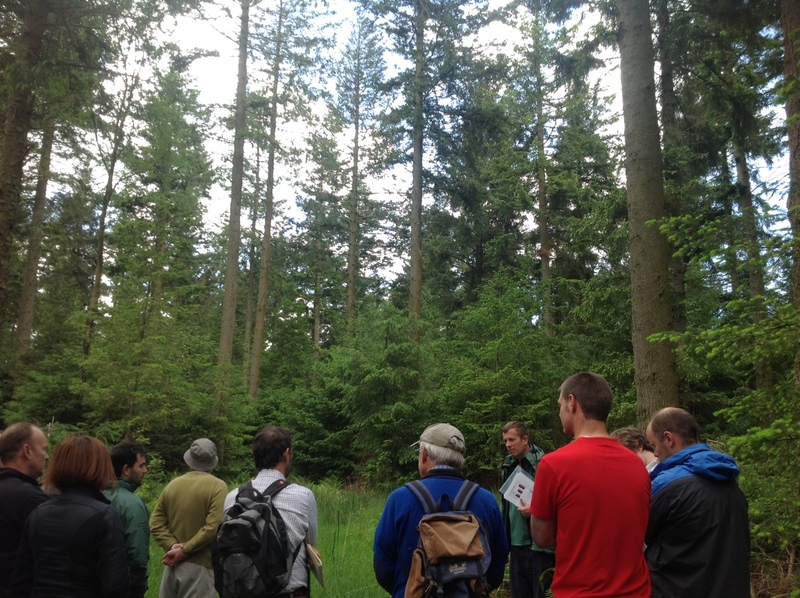 The natural regeneration in many of the forests was very impressive. Some of the Douglas fir and other broadleaves in this wood. Phil Morgan (CCFG UK) discussed the AFI international framework, begun in France, that is helping facilitate long-term research of permanent stands. Ireland is doing well in having already established some longterm research stands. At Thirlmere forest there was talk regarding the necessity of developing permanent forests for water quality issues (and a recent outbreak of Phytophthora affecting larch); The transition to a changed management for this watershed had taken time to be accepted by the local community but people are now realising the tourism, soil stability in the surrounding hills and biodiversity benefits. Small scale log moving machines are necessary for selective harvesting. Elspeth MacDonald, Forest Research, talked of timber quality and harvesting; timber quality is being assessed by newly designed sonic testing equipment. Some of the data from a recent paper. Two ways of testing for timber density 1) for standing timber – measuring the rate of sound travel across a measured distance up the tree trunk. Our thanks to the conference organisers and the warm welcome we received from the CCFG UK /ProSilva Great Britain members.